Do not miss the bands "One Night Only" performance and their meet and greet from 5:00pm to 6:00pm. Only $5 entry from 5-7pm and $8 after 7pm. The Young Dubliners return to our stage to take us back to define the music that made them famous. 2018 marks the band's 20th year of performing, quite the record, quite the group, join us to say thanks to the band and its founder Keith Roberts for the huge success. 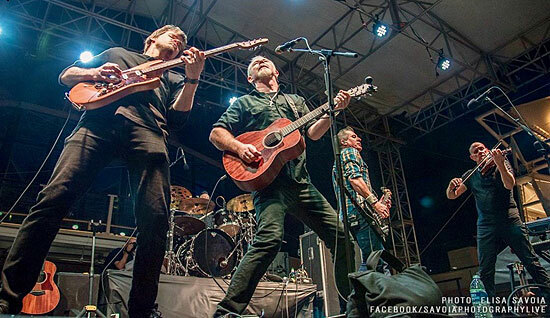 The Young Dubliners are quite possibly Celtic rock’s hardest working band, playing hundreds of shows to thousands of fans across the US and Europe every year. In recent years they have twice appeared on ABC’s Jimmy Kimmel Live Good Morning America, had songs featured in TV shows (Sons Of Anarchy, Human Target) and toured extensively as a headliner and as the opener for such a diverse list of artists as Collective Soul, Jethro Tull, Johnny Lang, Los Lobos and many more. Although the Young Dubliners sound is most commonly called ‘Celtic Rock’, that label, as labels often can be, is misleading. The Irish influence is there, certainly, but it’s not the only influence that rears its head on their albums, or in live shows. After all, several of the band members have no Irish roots of any kind. “That was always the idea”, Keith Roberts, lead singer for the band explains.The sound was always intended to be a hybrid because we all come from different backgrounds. Even though two of us are from Ireland, a lot of the music we listened to growing up wasn’t Irish at all, but when we got here, we got homesick and developed a new appreciation for Irish Music.